More than 25,000 landless families in Indonesia's Aceh are still waiting for new homes following the 2004 Asian tsunami, aid agency Oxfam has warned. The agency said that while considerable progress had been made in Aceh, the rebuilding effort was bypassing the poorest members of society. Groups most affected included those who rented houses or squatted on land before the disaster struck. Over 130,000 were killed and 500,000 left homeless in Aceh by the tsunami. 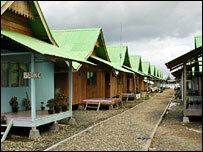 "Aceh has made enormous strides towards recovering from the tsunami," Director of Oxfam Barbara Stocking said. "But two years after the tsunami struck, the poorest Acehnese - squatters, renters and women - are still facing a crisis over when and where they will be resettled." Large numbers of people remain in cramped, sometimes unhygienic, conditions in temporary barracks. Part of the problem is that up to 15% of agricultural land in western Aceh was submerged or ruined, and trees or paths which marked plot borders washed away, Oxfam said. Additionally, most of the province's land titles were destroyed by the waves, while many people lost their identification documents, leading to confusion over inheritance claims. "Rebuilding homes without knowing who owns the land could create problems in the future," Ms Stocking said. "But this can be a desperately difficult and slow process." The agency called on the government to implement policies that would help rehouse the landless and end what it called the barracks problem. Last week, former US President Bill Clinton voiced concern at slow progress in rehousing those left homeless by the tsunami. During a tour of affected areas in India, Thailand and Aceh, he said that only about a third of those affected by the disaster were back in permanent housing.